It's shaping up to be a busy work week for me, so I'm not playing a lot of games. I did get to watch an episode of Archer with my wife while I was taking a meal break yesterday and I realized I haven't written anything about it even though I've been watching through the entire series. Archer is a really funny show. I know everyone's humor is different, but something about it strikes a chord with me. I usually laugh out loud at least once every episode. That's super rare for me. Most popular comedy shows don't do much for me and rely heavily on dumb humor that I don't appreciate. Something about this one just clicks with my sense of humor. 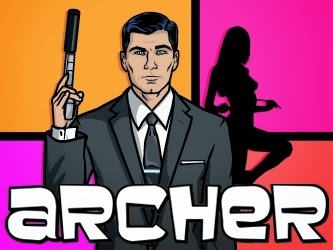 When I first looked into Archer I was turned off by the fact that it's an animated show. I didn't realize how adult it actually is. Looking at stills don't do the show justice. I would recommend checking out the show if you already have a Netflix subscription, since there are 4 seasons sitting there just waiting to be streamed. I really like it.